There are so many choices when considering the selection of the proper and correct floor finish for a facility. When it comes to floor waxing polishing & cleaning some of those choices can be confusing. For this reason we wanted to provide our readers and visitors with a guide to assist in selecting the correct and proper floor wax polishing & cleaning product system that will deliver the results with the emphasis of eliminating costly trial and errors. More specifically, the goal of this article is to provide a troubleshooting or selection guide for floor waxing polishing & cleaning products but also provide questions to get to the right decision on which floor finish, wax or polish the consumer is making. For the most part, this article is directed primarily to the commercial end-user decision maker but it can also be applied to the residential homeowner as well. 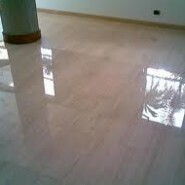 If you are more interested in or having problems with floor finish, wax or polishing issues. We would recommend you click on the following link to take you to our floor finish, waxing or polishing troubleshooting guide (Floor Waxing Polishing & Cleaning – Troubleshooting Hints). There are several key points to consider in addition to the selection guide below. Appearance Level: Glossiness is next to Godliness when it comes to the gloss of a floor. Some market sectors like Retailers demand a “Wet Look” gloss level for the floors. With this stating, determining your gloss level goals is important when using the selection guide below. Labor Budget: This is critical because of the obvious reasons but knowing your floor care budget will allow determining what product including factors like solids content, ease of stripping, soil resistance, etc. Non-Volatile Solids Content: This is the amount of the floor finish, wax, polish that is left on the floor after it has dried. High solids can provide more material on the floor to fill the pores quickly and obtain a gloss level that you desire faster than lower solids floor coatings. However, it is also important o realize that a higher solids floor coating does not mean better performance. Ease of Stripping: This needs to be tested but discussed with your floor coating supplier. Labor is always a premium cost for end-users and eventually the old floor coating will need to be removed completely and refinished with new floor finish. So, a floor finishes that strips ease and quickly is an important point to consider. Some floor coating types based on the chemical make up can be difficult and some even impossible to remove from the floor. How to use the flowing floor finish, wax, and polish selection guide is easy. Simply predetermine what your floor care appearance goals are including labor budget and add up the 3 most important characteristic categories points such as gloss level, heel marking, scratching, Buffable, durability, etc. The highest number will allow you to determine where to start in your decision process on whether to use an Ultra High Speed, Conventional, Multi-Purpose, etc. floor finish, wax or polish for your facility. As an example, if high gloss and buffing response along with durability is important to achieving your floor care objectives, then an Ultra High Speed Floor Finish would be the most likely type of floor finish to use. This is a starting point and it will allow the facilities manager to work with various floor waxing, polishing & cleaning companies on these types of floor coatings. This will reduce the decision-making process and reducing errors in the deciding which floor costing is right for your building. Hopefully, this information will allow our readers the opportunity to be better informed when deciding purchasing floor waxing polishing & cleaning products and assist in making the right choice for our readers specific floor care needs.